Creative Structure: An Architect and a Teacher Talk Values, Flexibility and Laundry | Balancing Act | Kids VT - small people, big ideas! 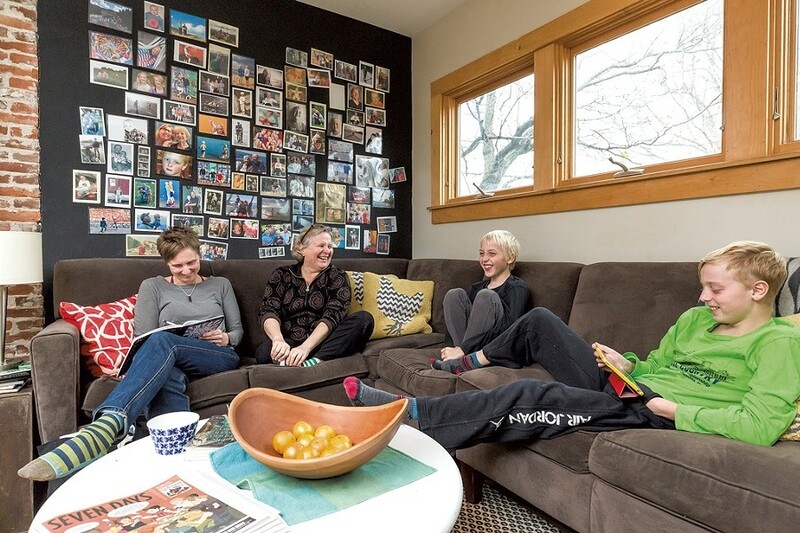 Enter the bright orange front door of Judy Klima and Anna Thelemarck's home in Burlington's Old North End, and two things are immediately clear: this family values art, and there's a lot of joy here. Framed children's artwork and dozens of family photographs hang on the walls, and laughter fills the space. A gray, L-shaped couch — occupied by a sleeping black-and-white cat — offers a cozy place to sit. The house is welcoming, warm and lively; it feels like a meeting place for families and community members. Thelemarck confirms that assessment. As her sons get older, she says, she hopes their home will continue to be a social hub, where teenagers can gather and connect. From her office at the Karma Bird House in downtown Burlington, the more introverted Thelemarck, a licensed architect, spends her days helping homeowners and businesses improve their living and work spaces. She enjoys the flexibility that owning her own business provides. 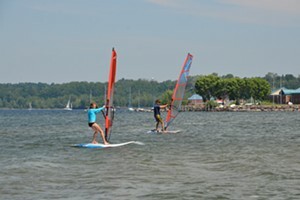 Last summer, she was able to take time off so the family could travel through Sweden for five weeks. As the arts integration coach at the Integrated Arts Academy at H.O. Wheeler in Burlington, the gregarious Klima spends the school year bringing together teachers, local artists and arts organizations to enrich the magnet school's curriculum. During the summer, she runs a two-week arts camp in the family's backyard barn. In November, Klima was named Vermont Arts Educator of the Year. She'll travel to Washington, D.C., in 2017 to be honored, along with other teachers from across the country. As dedicated as Klima is to her job, she is equally passionate about being a mother. But she doesn't take herself too seriously: Both Klima's and Thelemarck's thoughts on parenting are punctuated with humor. Judy: It's usually the early risers — Anders, our older son, and I — who get up first, around 6:30. Lately, we haven't been sleeping well, and our stress has been waking us up at 5! Sometimes I like to come down before him so I have a little bit of time by myself, but he usually hears me and comes down. Kuba is the longest sleeper, and Anna usually gets up a little bit after us, right? Anna: During the workweek I am the late person. On the weekends it flip-flops, and I am the early riser and you sleep in. But during the week, you usually get the breakfast stuff and the lunch stuff — you get all that in motion and I am upstairs getting them dressed and ready. Judy: Well, there is that older kid thing now where Anders gets ready on his own mostly, but usually I am the downstairs person and you are the upstairs person. I work at the school the boys go to — well, now only Kuba — so it used to be all three of us going to the same place, but now Anna and Anders go together and Kuba and I go together. Judy: Before the school year started, we sat down for a few hours and talked about how we could make our lives run smoother this year. We made all these plans, and we actually typed it all up! We came up with an agenda. Someone told me that families with systems work the best, so we came up with a system. Our theme for the year is "personal responsibility." Anna: We set up a board with things for them to do, clothespins for them to flip on and off if they've done it or not. Judy: I printed it out, too, and put it on the fridge. And we have a family meeting every week, so I even glued it into the family meeting book! Anna: There's a structure in place, so even if you get off the structure for a bit, you know what to come back to. We revisit it every week. Anna: We have a meal plan in the system, so you don't even have to think! It's going to be chicken on this night; it's going to be pasta another night. There's variety with it, but it's easy to shop. It simplifies things. On Monday night, I cook with Kuba, and on Wednesday it's Anders' turn [to cook with me]. Anna: The time of the year impacts our schedule dramatically. Judy is a teacher, so when the kids have off, she has off. When she's in school, I'm the "on" parent. So if the kids are sick, I'm home with them. If the kids have to go to the doctor, I'm the one who takes them. In the summer, it's reversed and Judy is with them and I work longer hours. When the kids were born, we made a conscious decision to take time with the kids over money. We always defer to that as our guiding thing.